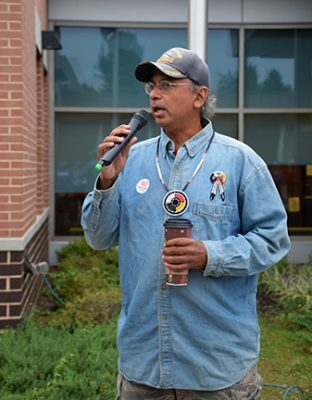 Andrew Tyler, from the Cherokee and Pamunkey nations and a representative of the Coalition of Woodland Nations, gave words of support to local residents and discussed the importance of fighting pipelines across the country for native peoples before the public hearing started. Stand with community members in Buckingham County on Monday, October 17 at the next Planning Commission meeting. 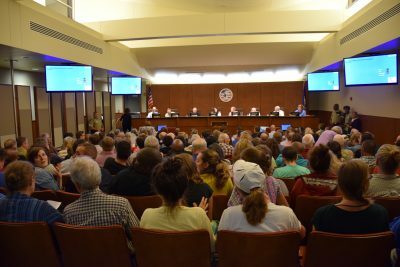 On Monday, September 26, the Buckingham County Planning Commission held a public hearing about the special use permit for the Atlantic Coast Pipeline’s 57,000-horsepower compressor station. Dominion Resources and Duke Energy’s joint project, the Atlantic Coast Pipeline (ACP), is proposed to carry fracked gas 600 miles from West Virginia, through Virginia, into North Carolina. The ACP’s three proposed compressor stations would run engines 24/7 to provide the pressure to push the gas through the pipeline. This permit would allow for huge industrial construction in an otherwise very rural and agricultural community and county. If approval for the construction of these compressor stations is denied, it would severely impact the viability of the Atlantic Coast Pipeline project overall. Dominion, the project’s lead developer, has already purchased the land for the Buckingham County compressor station from plantation-owner descendants in a largely black historic community called Union Hill. Over the last two years, Buckingham County has received much less media attention than other counties fighting the ACP. When we held a press conference before the public hearing, only one reporter attended from a local newspaper in a neighboring county. This is an environmental racism and justice issue at the core. If built, this compressor station would be one of the largest in the country. Surrounding communities would be severely impacted by noise pollution, air pollution, and disruption of the community’s culture. Dominion is doing its best to take advantage of a historically marginalized, low-income, rural and isolated community by locating the compressor station in an area where people are less likely to have the resources to resist. Despite Dominion’s efforts, word is getting out about Buckingham’s fight. Friends and neighbors are rallying to support the effort against the compressor station and pipeline there. Members of the Buckingham County Planning Commission look over a packed room of people speaking out against the Atlantic Coast Pipeline compressor station. The September public hearing served as an opportunity for those of us working against the pipeline to support Buckingham County residents on the ground. Local folks, neighboring activists and friends flooded the County Administration Building, with almost all attendees wearing “No Compressor Station” stickers to give the planning commission a clear sign of where we stood on the issue. Fifty-four people signed up to give public comment, nearly all of them local residents concerned about the potential compressor station. The public comments lasted so long that the planning commission took the rare step of setting up another meeting to hear the rest of the community input. This means that we also delayed the progress of the compressor station a couple more months. The planning commission will hear the rest of the public comments on October 17 and will eventually give a recommendation to the Board of Supervisors, which will make a final decision on whether or not to allow Dominion the special use permit to build the compressor station. 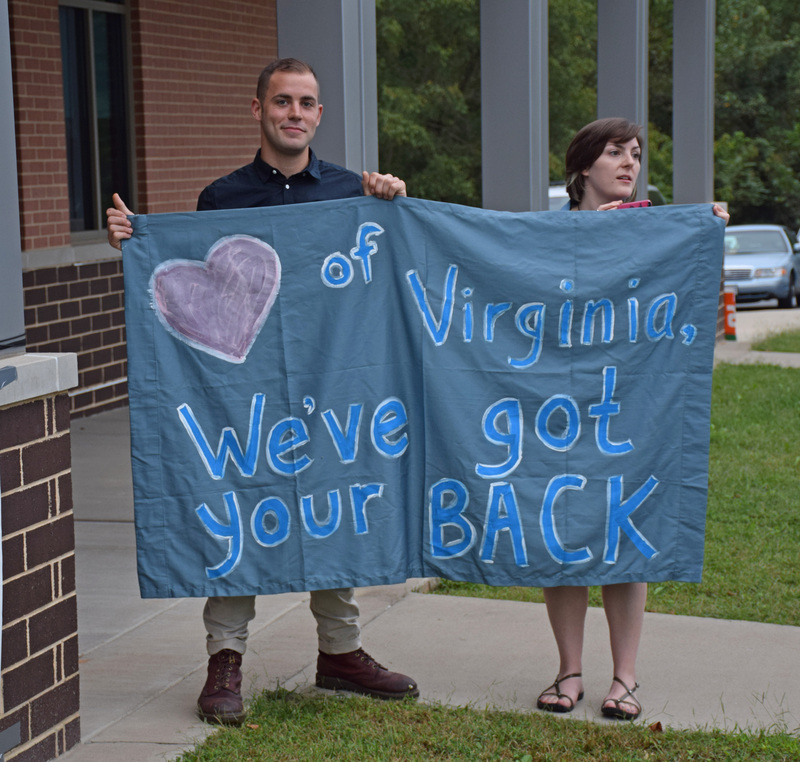 Though a lot of work needs to continue to support and amplify the most marginalized voices in Buckingham County and along the ACP, local residents appreciated the show of support and were invigorated by the strong presence against the compressor station.